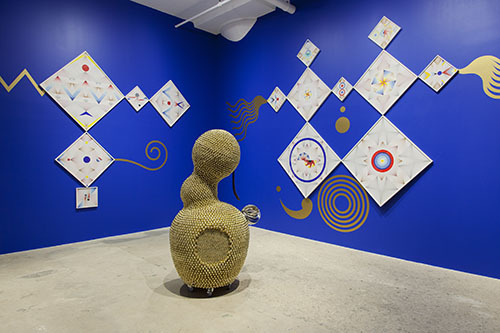 Greene Naftali is pleased to present Quasi-Pagan Minimal, the gallery’s second solo exhibition by Berlin- and Seoul-based artist Haegue Yang. Working in two and three dimensions, Yang takes as a conceptual starting point the alienating effects of global industrialization, examining contemporary life as estranged both historically and geographically. 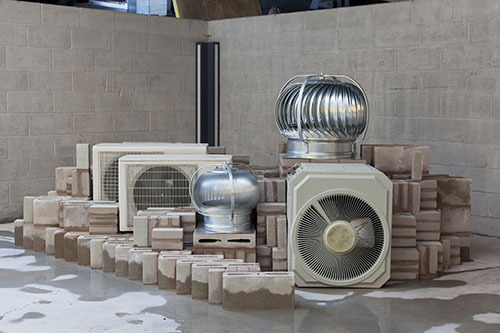 For this exhibition, Yang has transformed the gallery into a site of intersection between the modern and the folkloric, unearthing memory and legacy within the spatial and temporal fractures engendered by late capitalism. 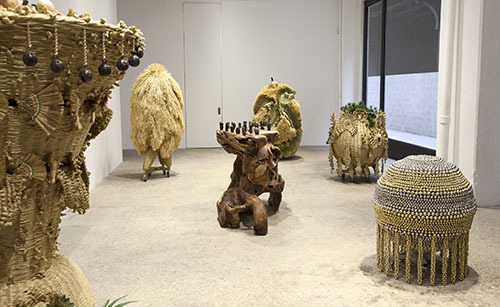 Utilizing both the gallery and its courtyard, the artist presents sculptures and works on paper that combine industrial fabrication and traditional craft, destabilizing the chronological distinction between the modern and pre-modern. Installed in the gallery courtyard are Yang’s industrially fabricated series, titled An Opaque Wind – Humbled Gray (2015). Brick constructions, the undulating tiers of which incorporate design traditions from pagodas to arabesque patterning, are topped by bulbous industrial air vents that behave as towers. Consistent in form, but disparate in material, the sculpture comments on globalization as at once teleologically continuous and a sudden historical break. 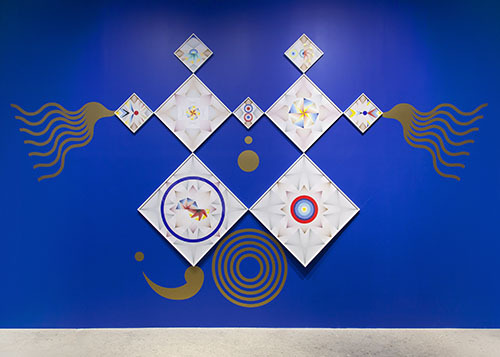 Yang continues to hold separate eras in tension in the main gallery with her recent series The Intermediates (2015), her Sonic Sculptures, and her modular Sol LeWitt Upside Down (2015). The Intermediates applies weaving to an artificial straw substitute, embedding tradition within the pervasive artifice of modernism. Meanwhile, the bells of the mobile Sonic Sculptures, emitting sound when moved, recall the broad historical occurrence of sonic elements within ancient rituals. 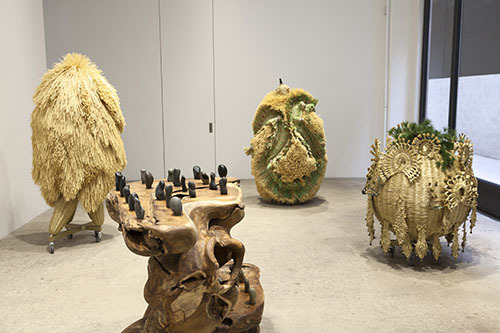 Installed nearby, Rooted Stones on Parallel Dimensions (2016) embraces the art of suiseki (the art of stone appreciation) and root carving, a decorative tradition that has fallen out of fashion. 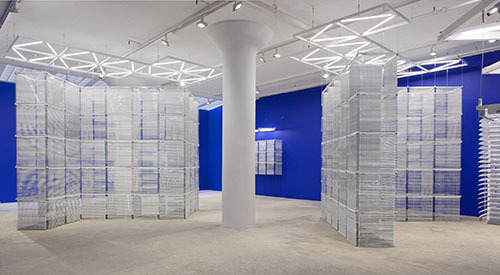 Installed among walls painted an Yves Klein–esque blue, is Sol LeWitt Upside Down. 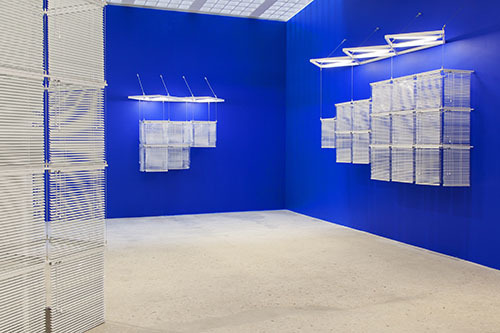 Yang supplements LeWitt’s otherwise vacant cubes with Venetian blinds – a familiar practical element in domestic and public spaces alike, used to shield interior activities from external view. 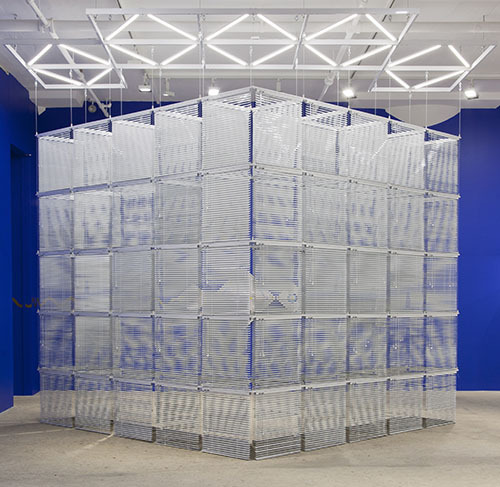 The suggested, ordered space carved into the air by LeWitt’s modular constructions becomes an actual site of enclosure. The constructions now obstruct the view beyond rather than lend it classical order. Yang also resumes her Trustworthies series, initiated in 2010: precise and kaleidoscopic collages made from the interiors of security envelopes, culled from around the world. Constellations of the meticulously handmade works are installed in variable arrangements that engage with architectural space, activating the compositions with a dynamic sense of movement. Organized chromatically to compose new narratives, the Trustworthies speak to both the contemporary influx of information and the privacy it threatens.